Over the past few months, I have finally tracked down more of the burgundy/grey/red/black yarn that I used to create my Skull Scarf. 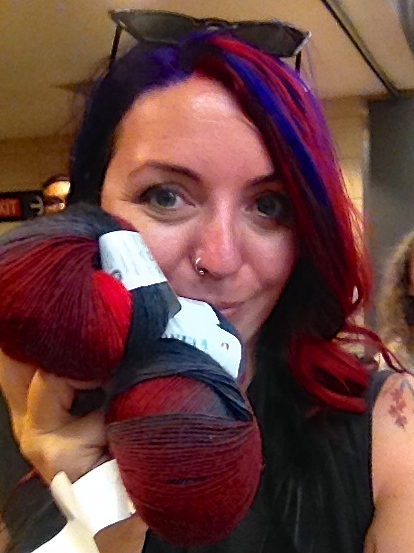 It was an incredibly difficult yarn to find. I scoured all the shops here in Toronto and, in August while on the TTC Knitalong, I came across half a dozen balls on clearance at PassionKnit. I wanted more so I could make more skull scarves so I spent a few hours hunting online. Finding the actual brand of yarn was fairly easy, it was finding the specific colour way that made the search so darn difficult. Eventually, I found a shop in Europe with some in stock and I ordered pretty much all they had. It arrived, all these lovely little balls of yarn smushed together in a sealed clear plastic bag…so lovely and exciting…begging to be knit and crocheted! 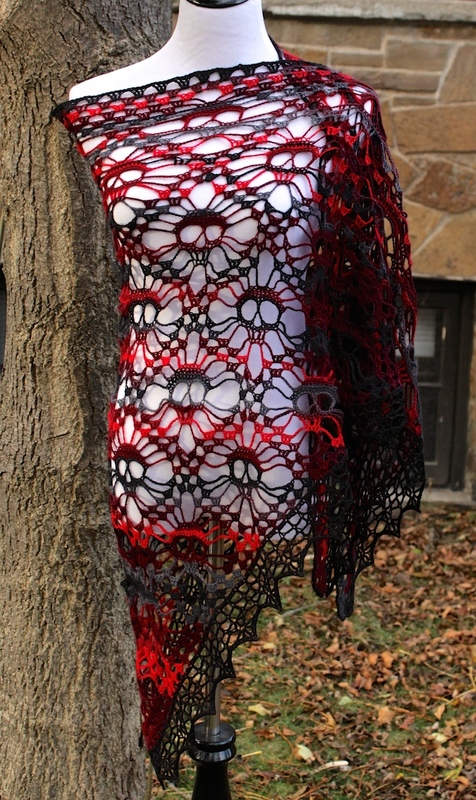 So in addition to making skull scarves, I set aside a few balls and started this shawl. 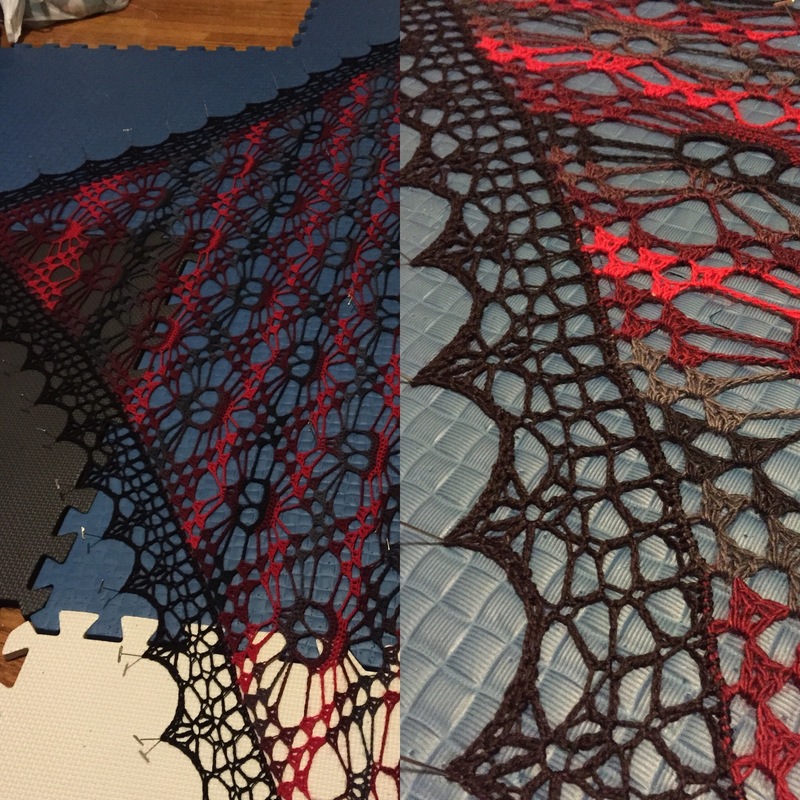 I used a smaller crochet needle than I typically use for this type of shawl so it took longer and resulted in quite a few more rows of skulls than usual (9 rows instead of the typical 6). I also decided to try a new (to me) and more complex border than my typical fringe or scalloped edging, which added a few more inches. 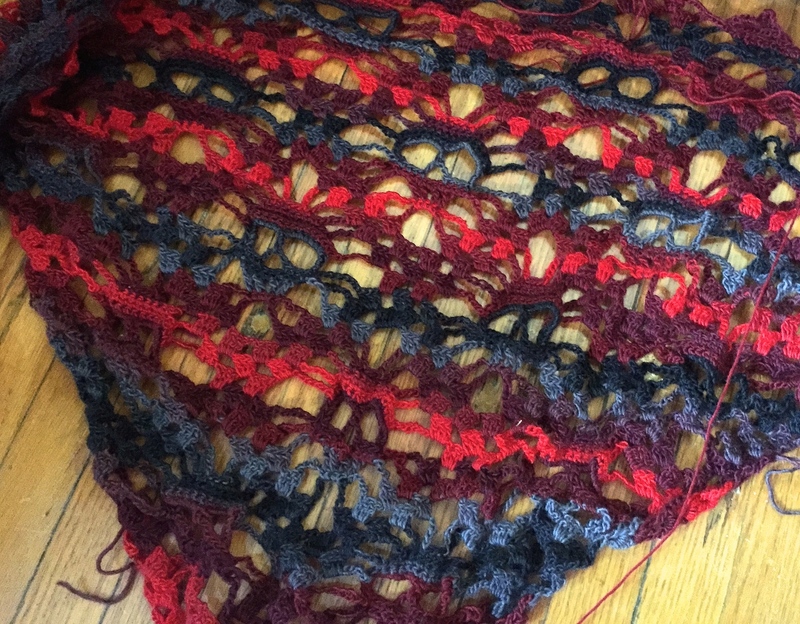 …and I ended up with a shawl that is 90″across the top and 44″ long, from top to point. It appears to have gained about a foot through the stretching and blocking process. Somehow I didn’t expect super wash wool to offer that much give. 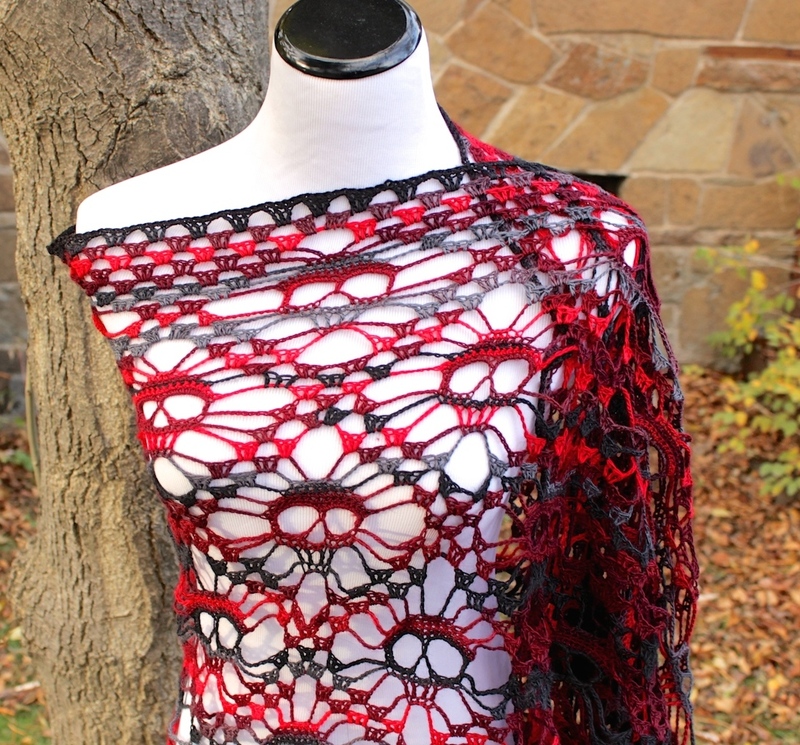 It’s a fantastic shawl….edgy, gothic with this awesome border…but it’s HUGE! Not necessarily a bad thing…just a fact. Next postFibrearts with Actual People: Better than Youtube! The edging is a pattern I made up in the moment and I unfortunately never wrote it down. I can see why you spent so much effort trying to source the yarn. It was really worth it.